Pop over to the Mojang site about now, and you’ll find an affectionate pastiche of Telltale Games’ dialogue-with-a-deadline schtick named Info Quest II. The exposition’s a little rushed, but with good reason: it turns out Mojang are collaborating with Telltale and the Minecraft community to make an episodic adventure series about Notch’s opus. 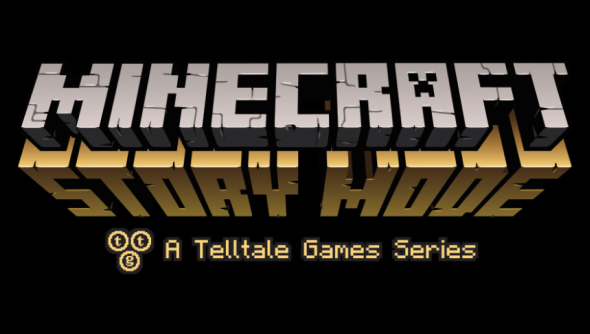 Minecraft: Story Mode will be a standalone, narrative-driven game, developed by Telltale in the style we’ve come to expect from them. Its first episode will be released sometime in 2015 for PC and Mac. The series will be driven by an original story set in the world of Minecraft and steered by player choice. Telltale say it’s “inspired by the Minecraft community and the game that continues to inspire a generation”. Expect a mix of new characters and “familiar themes”. For their part, Mojang have been working with members of their community to ensure the series winds up “as Minecrafty as possible”. “Don’t be scared,” they reassure fans. “We’re not laying down official lore or anything like that. You can still interpret or play in the world of Minecraft however you want. So why make a Story Mode at all? Mojang have begun to realise that there’s a massive demand for fiction set in the Minecraft universe. “People love engaging with the world, whether they’re building, adventuring, or role-playing an awesome creeper slayer,” they explain. “The tricky bit is working out how to explore a story without diluting Minecraft itself. A Telltale game set within the world is one way to delve deeper without laying down official lore. It’s one interpretation of the world and its logic. Cool! Is it cool with you?